Erste und einzige Ausgabe. - Poggendorff II, 641; Demandt I, 707. 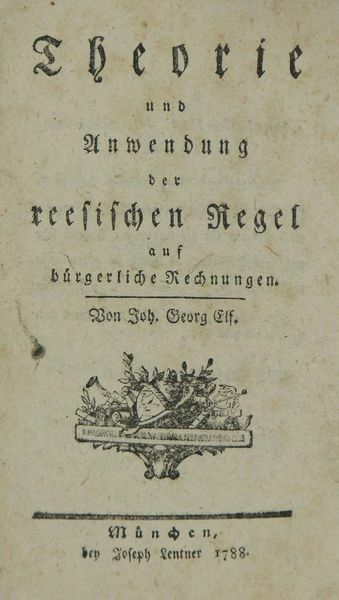 - Johann Philipp Ries (1751-1794) gilt als der bedeutendste Geologe Hessens seiner Zeit in vorliegender Schrift ist die erste geologische Karte Niederhessens enthalten, die durch ihre Kolorierung die Vorkommen der unterschiedlichen Mineralien darstellt. Seine Schnitte der Zechen bei Oberkaufungen und am Meissner zeigen die geologischen Strukturen, bzw. das Profil des Meissner die Übergänge von den tertiären Sedimenten zu den darüber lagernden Basalten mit allen Übergangsformen einschließlich des darin umgegangenen Bergbaus. - Titel verso und recto gestempelt, Karten verso ebenfalls. Leicht wasserrandig. With engraved title vignette and 6 (1 coloured) engraved folding plates. 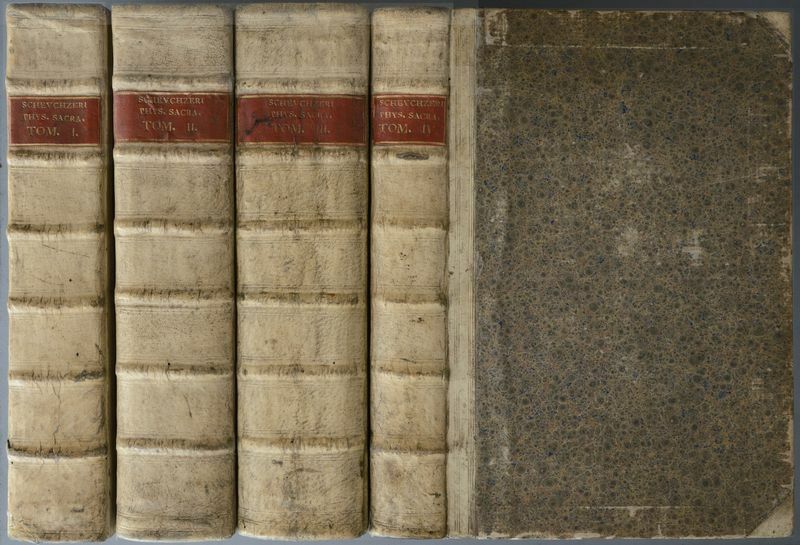 Contemporary boards with title on spine, (slightly rubbed, corners and edges slightly bumped) First and only edition. - Poggendorff II, 641; Demandt I, 707. - Johann Philipp Ries (1751-1794) is known as the most important geologist of Hessia in his time. 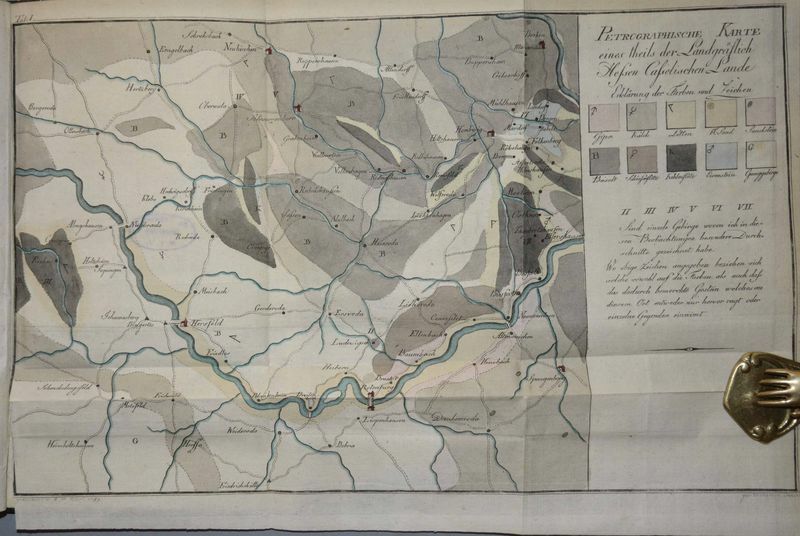 This edition with the first geogical map of Niederhessen, which is presenting the different minerals. His cuts of the mines near Oberkaufungen and Meissner are illustrating the geological structures and the profile of the Meissner with his intersections. - Title verso and recto stamped, as well as the maps. Slightly waterstained. Sabbatini 279 u.280 (jew.EA.v.1674); vgl.Graesse; BMP 107; Rosenthal,BMP 964 u.966; Ackermann IV, 554. - Diese beiden Werke des Autors wurden meist in einem Band aufgelegt. - Name auf Vorsatz, überklebter Stempel auf Titel verso, gering stockfleckig und papierbedingt leicht gebräunt. 1 nn. l., 155, 1 w. l.; 4 nn. ll., 182 p., 31 nn ll. With numerous woodcuts. Contemporary parchment with gilt title on the back, (slightly stained, slightly bumped). - Wellcome III, 282; cf.Graesse; BMP 107; Rosenthal, BMP 964 u.966; Ackermann IV, 554. 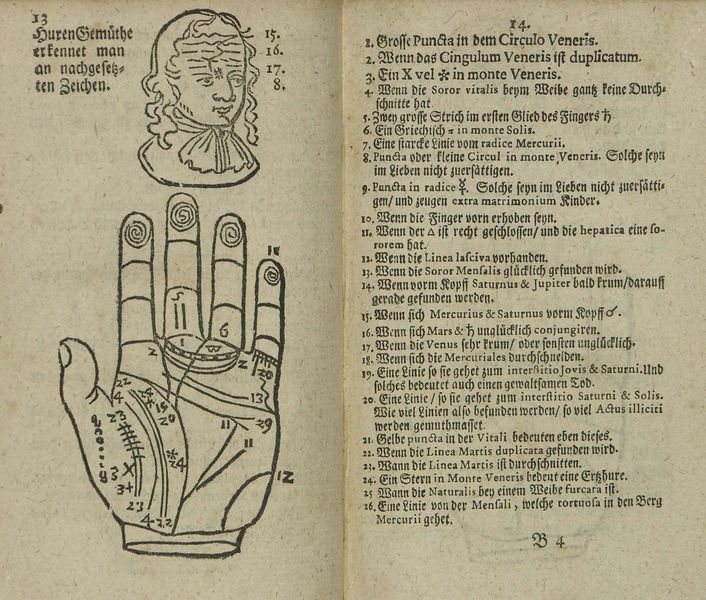 - Fifth enlarged edition of Höping's main works on chiromancy and physiognomy. These two works were mostly published in one volume. - This issue with an extensive register. - Partly somewhat brown-spotted, ex-libris on inner cover, owner's entry from old hand on endpaper. Erste Ausgabe. - Seltenes Rechenbuch des in München lehrenden Repetitors für Physik und Mathematik. - Minimal braunfleckig. 8vo. 8 nn. ll., 328 pp., 3 nn. ll. Boards with label on spine, (slightly rubbed, lower joint slightly cracked).- First edition. - Rare arithmetic book by the Munich teaching repetitor for physics and mathematics. - Minimally brown spotted. Erste Ausgabe. - Houzeau-L. 9333; Wellcome III, 513. - Das 3. Buch beinhaltet die Astronomie und das 9. Buch die Theorie der Planeten. Mit einer Abhandlung zur Nautik, sowie einem Kapitel zum Festungsbau. - Ohne das Porträt. - Etwas gebräunt und gering fleckig, am Anfang Ränder leicht wumstichig. With 44 (36 folded) engraved plates and 9 engravings in text. (without portrait). Contemporary calf, (back restored, somewhat worn). First edition. Houzeau-L. 9333; Wellcome III, 513. Astronomy in the third part and theory of planets in part nine. Includes also texts on nautics, as well as fortification. Without portrait. Slightly browned and spotted, some wormwholes at the beginning. Erste Ausgabe. - Barbier IV, 743; Poggendorff I, 489. - Wichtiger Beitrag zu den optischen Abhandlungen Newtons. 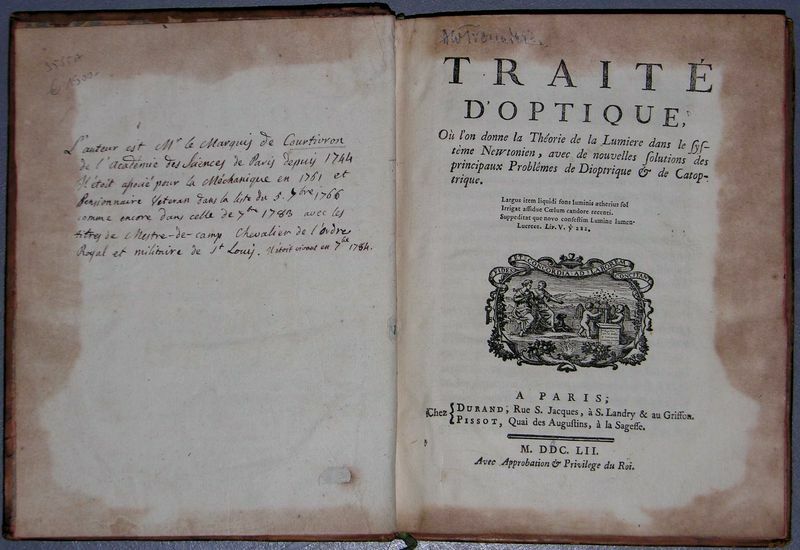 - "In his treatise on optics Courtivron assailed the Cartesian concept of light and championed the Newtonian. He did not servilely follow Newton, however, for in his view color results from differences in speed rather than from those in weight. Furthermore, in affirming that dense mediums slow down light corpuscles, he made use of Fermat`s principle of least time, recently revived by Maupertuis." (DSB). - Papierbedingt etwas gebräunt, Innendeckel mit Fehlstelle des Vorsatzpapiers durch entferntes Ex-Libris, Eintrag von alter Hand auf fliegendem Vorsatz. Titel leimschattig. With 7 folded engraved plates. Contemporary marbled calf, spine richtly gilded, gilt edges, (slightly worn, edges a bit bumped, rests of library label on spine). First edition, rare. Barbier IV, 743; Poggendorff I, 489. Important contribution to the works on optics by Newtons. "In his treatise on optics Courtivron assailed the Cartesian concept of light and championed the Newtonian. He did not servilely follow Newton, however, for in his view color results from differences in speed rather than from those in weight. Furthermore, in affirming that dense mediums slow down light corpuscles, he made use of Fermat’s principle of least time, recently revived by Maupertuis." (DSB). Due to condition of paper somewhat browned, frontpaper incomplete (removed bookplate), old entry of flying frontpaper. With engraved frontispiece, 2 engraved portraits and 760 (1 partly coloured, 5 doublepage-sized) engravings on 758 plates. Contemporary half calf with labels on spine, (slightly worn and spotted). - First Latin edition. - Nissen ZBI 3660; Faber du Faur 1855; Lanckoronska/Oe. I, 32; Pritzel 8174. 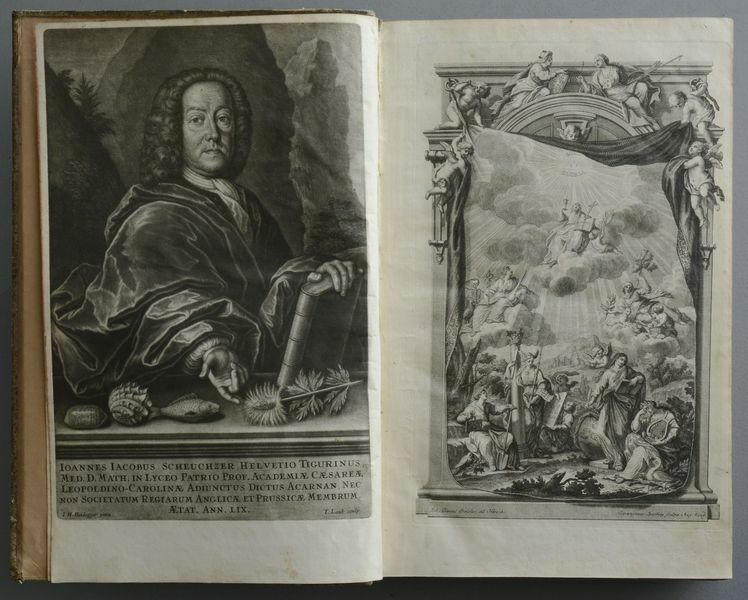 - The so-called "Scheuchzersche Kupfer-Bibel" is belonging to the most beautiful Augsburger works with engravings and a highlight of the baroque bookart. The engravings are by Augsburger artists after the drawings by the Swiss painter Johann Melchior Füßli. - The Swiss scientist and polymath Scheuchzer (1672-1733) was in contact with numerous scientists of Europe and tried to explain all texts of the bible relating to natural sciences. "Besonders bemerkenswert sind S.s einzigartig gebliebenen Versuche einer naturwissenschaftlichen Exegese der Hl. Schrift..." (NDB 22, 712). - "In Scheuchzer's gigantic work... the Baroque attains, philosophically as well as artistically, its high point and its conclusion." (Faber du Faur). - The nice engravings framed with ornaments and figures are showing plants, reptils, birds, mammals, fantasy animals, fishs and figured sceneries of life and of the bible, handcraft, commerce, mining, etc. - The two portraits are showing Scheuchzer and Pfeffel. - Plate 66 with the rainbow partly coloured. - Partly some foxing, a few of the plates trimmed close to the margin. Nice copy.